With sales of over £150m worldwide, of which over 60% are overseas, this design-led business, which started in Nottingham in 1976, is now a large organisation employing over 700 people. Ashley Long, Finance Director of Paul Smith Ltd, is constantly looking for ways of improving the already impressive profitability of the company. 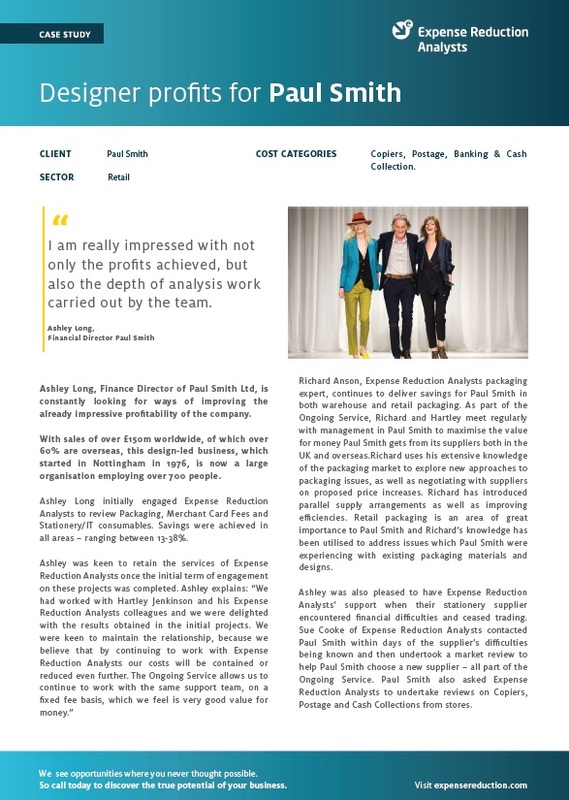 Ashley initially engaged Expense Reduction Analysts to review Packaging, Merchant Card Fees and Stationery/IT consumables. Savings were achieved in all areas – ranging between 13-38%. To find out exactly how ERA helped Paul Smith, including specific examples and cost savings, download the full case study today. Interested in knowing more about how ERA can help your organisation? Contact us today and discover what our network can do for you.